← Who to ask? (2) or What do students want? There he was, slowly coming up the stage. Over 15 years later, he was back to Moscow for only one day to give talks on issues he is presently concerned with at the annual Macmillan Conference in June, 2012. This is how Jim Scrivener elegantly advanced his cause of bringing literature back into the classroom. All at once, the whole audience was grasped by Jim’s and poem’s charm. All usual hums and noises subsided instantly; everybody was tuned in and eager for more. Jim didn’t fail to meet the audience’s expectations. 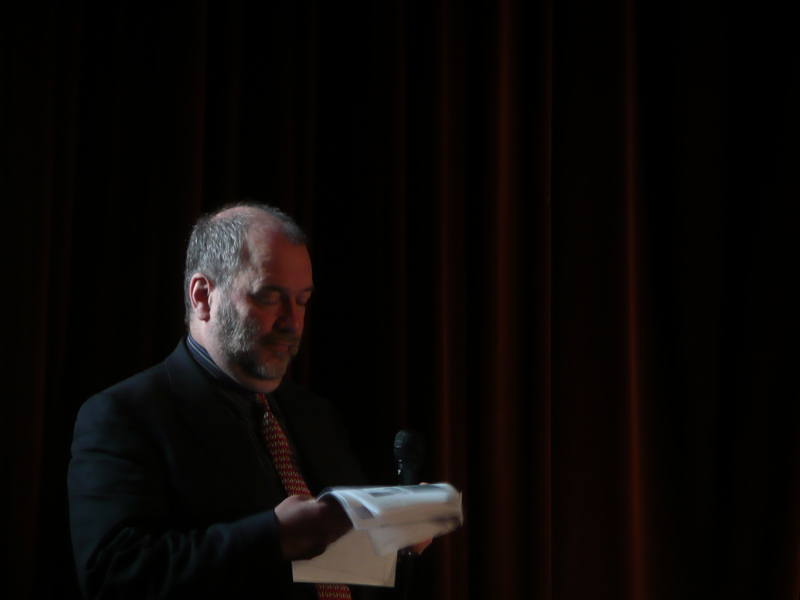 He gave a highly inspirational talk on how literature can be easily integrated into modern communicative teaching. First of all, Jim pointed out that literature has been unjustly thrown out of the language classroom in the sake of the communicative techniques. However, a book, Jim claimed, can and has to be a social experience, which means a shared experience. Literature allows us to communicate through time and space: we can learn about the past and predict possible futures; it can take us to places we have never been to. Books address our emotions and integrate with our own lives. In fact, literature IS communication and language in use. If you look at books from this perspective, you will easily see how greatly they can contribute to the communication between the language learners and to learning languages as well. Jim quoted Alan Maley’s 7 reasons why literature should be more widely used in language teaching, they are: literature’s universality, non-triviality, personal relevance, variety, interest it generates, economy and suggestive power, and ambiguity. Then, Jim went to speak about how to introduce literature to learners without putting them off it but instead by wetting their appetite for it. The prime questions here are “How can teachers get learners to enjoy a text?” and “How can teacher get them to “swim around” and take pleasure from it?” Jim admits that there are no easy answers to these questions but he believes that anything that involves learners and brings them to literature will definitely help. To the traditional “predict and then pre-teach vocabulary” way of introducing texts, Jim offers an alternative of getting students into the meaning before they meet the text. One way to do so is to set up a discussion around the topic raised in the text or to put learners into a situation described in the text and to ask them to perform some tasks or to solve some problems arising from the situation. In this way learners will live though the situation and when they are reading the text they will easily get the meaning without stumbling over unknown words. Jim suggested some other ways to introduce a text. There could be a picture dictation, a comic based on the original book, or a word cloud with the words from the text so that learners could predict what the text they are going to read is about. To make reading even more powerful tool in language learning, it can be accompanied with some writing activities which will help learners to develop their language production skills. During his presentation, Jim mentioned some creative writing activities which, in my opinion, will undoubtedly be welcomed by learners. Among many other activities there were a six word story, acrostic and spine poems, using a metaphor or a simile from the text for learners to complete with their own ideas and many other. Jim also offered some amusing activities that can be used while reading longer texts, such as Talk Show, The News issues, a Fakebook and others. All in all, I should hardly think that after Jim Scrivener’s inspiring talk there was anyone left unconvinced that it’s high time for literature to make its victorious comeback into language classrooms. Jim Scrivener’s second presentation that day had an intriguing title: Can teachers teach? Certainly, Jim didn’t question our teaching skills, but the point he was about to make had a solid footing. I can’t agree more with Jim that a lot of teaching is going on but it is leading to relatively little learning. No doubt teachers are doing their job well but the result of their hard work isn’t the one that they would expect. Jim claims that neither teachers nor methods are inadequate but the lack of demand and challenge learners face is to blame here. According to Jim, in the modern classroom, “generalized encouragement replaced the feedback on what students can do better”, which doesn’t lead to upgrading learners’ language. “The teacher is somehow satisfied with less.” That’s why we can see a large undemand in the language classroom where learners are underchallenged. “Somehow teachers tend to step back and vanish into the wallpaper or perform too much of entertaining”. As the result the learning goals are lost and unachieved. It is OK to teach. We need to focus on where the learning is. You have permission to be active interventionist teacher. Learn the classroom management techniques that make a difference. Risk working hands-on with language. Expect more – demand high. I think it’s pointless to describe all the principles of the Demand-High Teaching in great detail here. It’s better to learn about it firsthand by visiting Jim and Adrian’s blog specifically devoted to the approach. There, one can find the detailed explanation of principles, lots of articles and other materials. I highly recommend visiting the blog and taking part in the discussions. The only thing I would like to add here is the way out suggested by Jim which is to try to increase the doable demand on students’ performance. Surely this is a little shift that can lead to considerable improvements in learners’ performance and language acquisition. To sum up, I’d like to say that those who came to the conference that day were happy not only to listen to two (not just only one as it’s usually the case at any conference) talks by Jim Scrivener but also to socialize informally with him during the break. 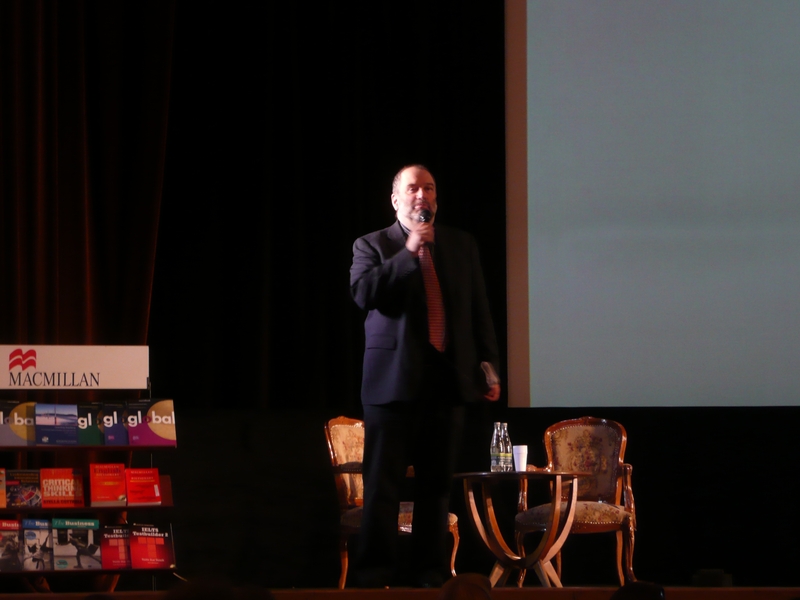 It was such a pleasure to see Jim Scrivener in person here in Moscow! I wish Jim could come to Russia much more often. I’m looking forward to seeing him back as soon as possible.